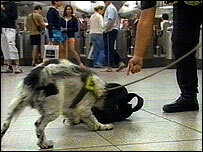 Sniffer dogs are being used across the London Underground to detect explosives in the wake of the London bomb attacks. Dozens of dogs are being used on trains, at ticket barriers and at stations after the blasts on 7 July. It comes as Tube bosses announce that most services will be fully restored within a fortnight. But police remain in control of Russell Square, scene of the most deadly blast, where the damage was much worse than the two other bombed Tube lines. Dogs were already being used on the Tube in east London to look for drugs and on the Heathrow Express to find explosives. Now they are being used across the Tube network, and will continue to be used "indefinitely", British Transport Police (BTP) said. The sniffer dogs being used, which tend to be labradors and spaniels, undergo an intensive eight weeks of training with their dog handler. The handlers watch to see if the dogs freeze or lie down when sniffing bags, which indicates that something is wrong. The spokesman added: "They operate just like dogs who search for drugs except they have been trained to sniff out explosives. "They [the dogs] are far more effective than any machine." BTP's team of 28 dogs are being used on Tube stations where the most people get on trains or where the network meets mainline rail lines, such as King's Cross and Victoria. Meanwhile engineers are repairing the damage at Aldgate, where a bomb on the Circle Line killed eight people. Aldgate Tube station could be open and a full Metropolitan Line service restored by Monday. The bombed carriage at Edgware Road, on which seven people died, is to be lifted out by a crane on Tuesday night, weather permitting, and LU expects police to hand the site back to them soon. The carriage will be placed in a specially-constructed cradle and placed on a truck, to be removed for further forensic examination. But damage caused by the explosion on the Piccadilly Line train between King's Cross and Russell Square, which killed 27, is thought to be "much more extensive". Russell Square remains at the centre of a police investigation and LU does not know when it will be completed. It said it will be several weeks before a full Piccadilly Line service can be restored. Fifty-six people died in the blasts in Tavistock Square, Edgware Road, Liverpool Street and King's Cross on 7 July. More than 700 other people were injured in the explosions. What lessons have been learned?